A Night at the Roxbury is a 1998 American comedy film based on a recurring sketch on television's long-running Saturday Night Live called "The Roxbury Guys". Saturday Night Live regulars Will Ferrell, Chris Kattan, Molly Shannon, Mark McKinney and Colin Quinn star. 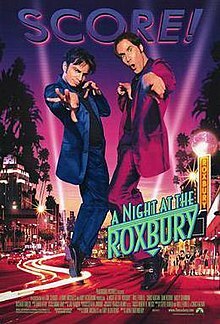 This film expands on the original Saturday Night Live sketches where the Roxbury Guys were joined by that week's host, and bobbed their heads to Haddaway's hit song "What Is Love" while being comically rejected by women at various clubs. Other roles include Jennifer Coolidge as a police officer, Chazz Palminteri's uncredited role as gregarious night club impresario Mr. Benny Zadir, and Colin Quinn as his bodyguard Dooey. Ex-SNLer Mark McKinney has a cameo as a priest officiating a wedding. Wealthy Yemeni-American brothers Steve and Doug Butabi enjoy frequenting nightclubs, where they bob their heads in unison to Eurodance, a subgenre of dance music, and fail miserably at picking up women. Their goal is to party at the Roxbury, a fabled Los Angeles nightclub where they are continually denied entry by a hulking bouncer. By day, the brothers work at an artificial plant store owned by their wealthy father, Kamehl. They spend most of their time goofing off, daydreaming about opening a club as cool as the Roxbury together, and Doug using credit card transactions as an excuse to flirt with a card approval associate via telephone that he calls "Credit Vixen." The store shares a wall with a lighting emporium owned by Fred Sanderson. Mr. Butabi and Mr. Sanderson hope that Steve and Emily, Sanderson's daughter, will marry, uniting the families and the businesses to form the first plant-lamp emporium. After a day at the beach the brothers decide that night was to be the night they would finally get into the Roxbury. Returning home, Doug gets into a heated argument with their father about going out clubbing instead of staying home. Their father has planned a dinner party with Emily and her parents. The angered Mr. Butabi then refuses them access to their BMW car and their cell phones. They are given enormous cell phones by their mother, Barbara, and allowed use of the fake-plant store's delivery van, but they are immediately rejected once again by the doorman. After discovering that they might bribe their way into the club, the brothers drive around looking for an ATM. They get into a fender-bender with Richard Grieco and, to avoid a lawsuit, Grieco uses his fame to get them into the popular club. There, they meet the owner of the Roxbury, Benny Zadir, who listens to their idea for their own nightclub. He likes them and sets up a meeting with them for the next day. The brothers also meet a pair of women at the Roxbury: Vivica and Cambi, who see them talking to Zadir and think that the brothers are rich. The women later sleep with Doug and Steve, leading the brothers to think they are in "serious relationships." On the way to the after-party at Mr. Zadir's house, the brothers annoy his driver and bodyguard Dooey by making him stop to buy fluffy whip and making jokes about sleeping with his parents. As revenge, the next day, Dooey refuses them entry into Zadir's office for their meeting. He tells the brothers that Zadir was drunk out of his mind last night and does not know who they are. In reality, Zadir wanted to see them, but does not have their contact information. Vivica and Cambi break up with the Butabi brothers after realizing they are not actually wealthy. Afterwards, the brothers argue over who is at fault for their sudden misfortune and Doug moves out of their shared bedroom and into the guest house. Meanwhile, Steve is forced into an engagement with Emily by his father. The wedding is held in the backyard of the Butabi residence, but is interrupted by Doug. Having gone on a fluffy whip-fueled bender, he interrupts the wedding, reconciles with his brother, and the wedding is called off, only to be restarted as Craig, the Butabi brothers' personal trainer, reveals his feelings for Emily. Afterwards, Grieco (a guest at the wedding) talks to Mr. Butabi to help him understand that Steve was not ready for marriage, and that Butabi is too hard on Doug. After the Butabi brothers reconcile with their father and Doug moves back into their bedroom, the film ends as the brothers happen upon a hot new club. The building is unique in that the exterior is constructed to resemble the interior of a nightclub, and the interior resembles a street—this was an idea pitched by Doug and Steve to Zadir earlier in the film. Attempting to enter, they are surprised to find their names already on the VIP list. In addition, Zadir reveals that to reward their idea, he has made them part-owners of the club. Their new-found success comes full circle when they meet two women in the club: Doug's phone operator from the credit card company ("Credit Vixen") and a police officer with whom Steve flirted while getting a ticket. A Night at the Roxbury was heavily panned by critics, earning an 11% rating on Rotten Tomatoes, with the consensus that A Night at the Roxbury "has the same problems as the worst SNL movies: one-note characters and plots unreasonably stretched to feature length runtime". Anita Gates of The New York Times acknowledged the film's appeal, but reasoned that it was "a lot like the brothers themselves: undeniably pathetic but strangely lovable. Still, do you really want to spend an hour and a half with them in a dark room?" Roger Ebert observed that "the sad thing about A Night at the Roxbury is that the characters are in a one-joke movie, and they're the joke... It's the first comedy I've attended where you feel that to laugh would be cruel to the characters." ^ "A NIGHT AT THE ROXBURY (15)". United International Pictures. British Board of Film Classification. January 7, 1999. Retrieved August 27, 2014. ^ "'LA Times' – Studios See $$ in Less-Than-Worthy 'SNL' Film Spinoffs". Archived from the original on May 9, 2006. Retrieved 2008-03-25. ^ "A Night at the Roxbury (1998) – Box Office Mojo". BoxOfficeMojo.com. November 13, 1998. Retrieved March 7, 2014. ^ "Various—A Night At The Roxbury (Music from the Motion Picture)". Discogs. Retrieved January 30, 2012. ^ "A Night at the Roxbury". Rotten Tomatoes. Retrieved March 7, 2014. ^ "A Night at the Roxbury - FILM REVIEW; A Lucky Break for the Terminally Uncool". The New York Times. October 2, 1998. ^ "A Night at the Roxbury". Chicago Sun-Times. October 2, 1998.